With the emergence of higher reliability and traceability requirements, an ISO/IEC 17025 certified 3rd party inspection service is essential in assuring and documenting gauge certification to today’s industry standards as well as your own product quality standards. 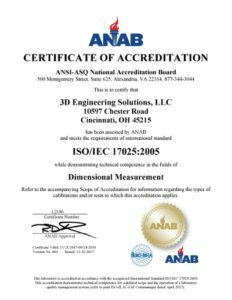 At 3D Engineering Solutions, we not only have the ISO accreditations needed to perform fully dimensioned gauge inspections at your site, but also the expertise to create certifiable reports that enhance documentation and audit capabilities. ISO/IEC 17025 is the main standard used by testing and calibration laboratories. There are many commonalities with the ISO 9000 standard, but ISO/IEC 17025 adds in the concept of competence to the equation. And it applies directly to those organizations that produce testing and calibration results. There are two main sections in ISO/IEC 17025 — Management Requirements and Technical Requirements. Management requirements are primarily related to the operation and effectiveness of the quality management system within the laboratory. Technical requirements address the competence of staff, methodology and test/calibration equipment.